Help Students Get Organized, Track Progress, Take Notes, and more with Google Keep! Google Keep is a robust G Suite tool that can help teachers and students create and share notes, lists, and reminders. There are so many possibilities that I decided to put together this post and infographic with ideas for how Google Keep can be used in the classroom: 15 Ways for Students to Use Google Keep! Learn more about how to use Google Keep from my Google Keep CHEAT SHEET (free download), and be sure to check out all of the Google Keep resources I am creating and curating. Google Keep is loaded with fun features that can help students get organized, track progress, take notes, and more. The infographic hits the highlights, but more details are also included below. Use this infographic as a reference and resource. Below are some more specific details for each of the fifteen ways mentioned in the infographic. This one may seem very obvious, but helping students learn how to manage their time and get things done is a very important skill. Google Keep will help students track their assignment tasks, set up reminders, so they don’t forget and manage their time in and out of class. The Google Keep Chrome extension makes it easy to bookmark a web page and add it to your Google Keep notepad. This is particularly useful for saving relevant classroom websites, tutorials, and resources that students need for particular assignments and throughout the year. Google Keep makes it easy to keep lists, so this is a no-brainer! Students can keep their spelling and vocabulary lists and easily access it from any device to study. Not only does Google Keep allow you to set up time and date reminders to remember all of your due dates, but it will also help you remember to complete tasks when you arrive at a certain location. For instance, students may need to remember to talk to a certain teacher when they arrive at school in the morning. With a location-based reminder, Google Keep will send a notification to your device when you arrive at that location. To learn how to set up location-based reminders, visit this support page. This may seem like another obvious suggestion but think beyond old school class notes. In Google Keep, students can jot down quick notes to themselves about a particular class or subject. They can then share those notes with other students in their group or class. Notes can even be completely collaborative! (Notes are so much more powerful when you share!) Take that one step further when your notes get too long, you can copy over to a Google Doc. Boom! G Suite power! As we move to more project-based learning initiatives, it is important to help students and teachers track and manage those projects. With Google Keep, students can easily keep track of each project, tasks, notes, and due dates. These notes can be shared with the teacher so he/she can monitor progress and help students learn how to manage big projects. Genius Hour moves beyond just managing projects. Google Keep can help students through each stage of the process. Students can use Keep for brainstorming ideas, research, drawing a prototype, tracking progress, reminders and due dates, taking notes, reflection and more! The research process is not easy, nor is it easy to teach. Number two above suggested using Google Keep for bookmarking, but let’s take this a step further. Students can use Google Keep as their digital notecards, not only bookmarking, but adding notes, citations, page numbers, etc. What a great way to help streamline the research process. Reading logs are great for keeping students accountable and tracking progress. Use Google Keep to log titles, dates and duration, the number of pages, or whatever else you normally have students track on paper. Google Keep has this super cool feature that allows you to draw, and it will also allow you to draw on top of an image. This means we can annotate and illustrate learning! Think of all the possibilities! Students can demonstrate their learning with a drawing, think through a process by drawing a mind map, or upload an image of a reading passage, life cycle, map, etc. to annotate! Learn more about drawing from the Google Support Center and my Google Keep Cheat Sheet. We have a lot of daily tasks and procedures in our classrooms–the things we do every day, like bellringers and warmups, writing down the agenda, silent sustained reading, journals, etc.. What if we put these into a daily checklist for students to help them create habits? This is also an excellent way to create other types of habits as well, like remembering to take your backpack home, drink water, exercise, etc. Collaboration has always been the number one feature of G Suite. No other product comes close! Google Keep is no different. When it comes to managing group projects, let’s give students the tools to succeed. Google Keep can help the group share and create notes, assign tasks, remember due dates, and hold each other accountable! Voice Notes is a feature available in the iOS and Android mobile apps (not currently available on the desktop version). This is a great way for students to take notes on the go, on a field trip, record word pronunciations, practice reading aloud for fluency, and more. Plus, voice notes can help some of our students who struggle with writing and typing. Of course, voice recording is also a great way for our little ones to talk about their learning, tell stories, and leave notes. Reflection is such an important piece of the learning process! Students can use Google Keep for daily journaling and writing reflections on daily learning, projects, self-assess their progress, and share what they did well and what they could improve upon. How are you using Google Keep in the Classroom? Please share in the comments below! Join the Shake Up Learning Facebook Group! YES! 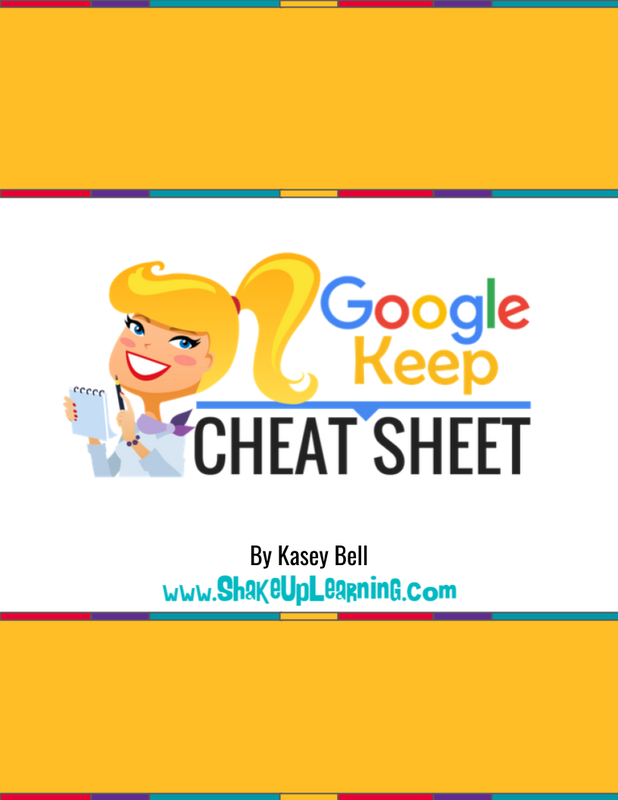 I want the FREE PDF copy of, "Google Keep CHEAT SHEET" Get this 9-page, printable pdf to save and read throughout the year. Success! Now check your email to confirm your subscription and download the full PDF of Google Keep CHEAT SHEET. I'm a new subscriber! Please send me additional resources!